In WordPress, navigate to Plugins > Add New. Search for “Photo Gallery by Supsystic” and click Install Now. When the installation has completed click “Activate Plugin”. You will have a new admin menu item titled “Gallery by Supsystic”. Go to the Gallery by Supsystic in WordPress navigation menu. Enter the name of gallery. 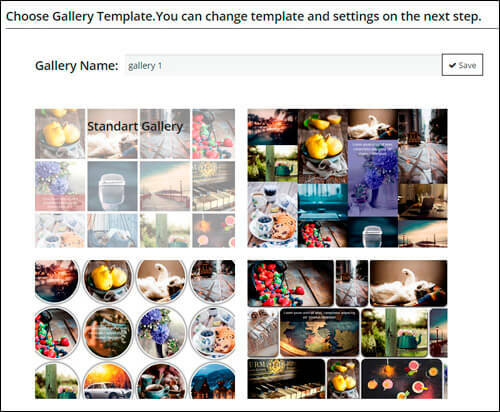 On the next steps you can change the settings of gallery template. 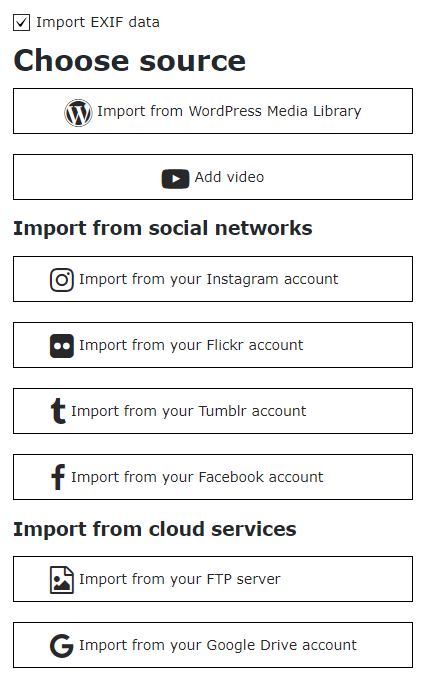 Choose Import from WordPress Media Library – mark those images that you like or need. If there are no images that you need, click the Upload Files tab – here you can drop files anywhere to upload or select files from your computer. Click on “Choose Image” button. If you want to import images from your FTP server, choose the corresponding option after clicking Add Images button. Then you’ll need to enter the folder name and press Parse. Note that images folder must be in wp-content\uploads\ directory.Also with WordPress Photo Gallery plugin you can import photos from remote server. Just tick the corresponding checkbox, fill in host, username, password and port and press Parse. Check this page to view more information about all Import Images abilities of Photo Gallery plugin. Change the order of images – simply by dragging them manually. Add new images from different sources to the grid gallery – click “Add Images” button and select the source to import from. Caption tab – add caption to an image. 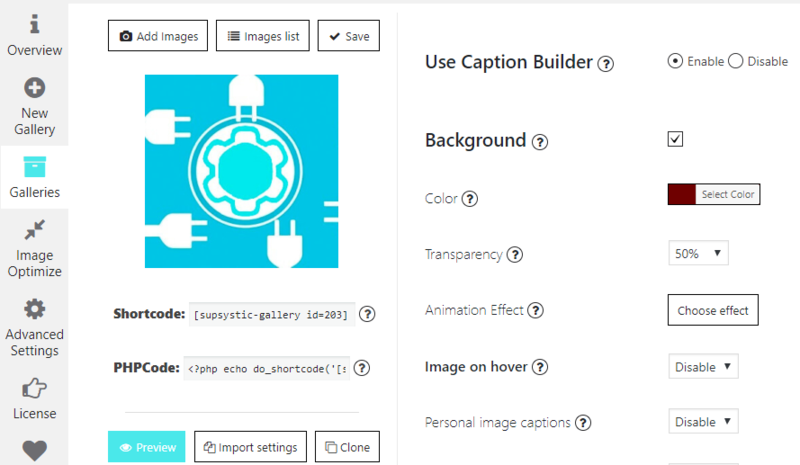 Caption effect tab – add effect to the caption. SEO tab – add tags for search requests. Link tab – attach links to an image – it will go to the link when you click the image. Video tab – attach video url – it will be displayed in a pop-up image when you click on a picture. 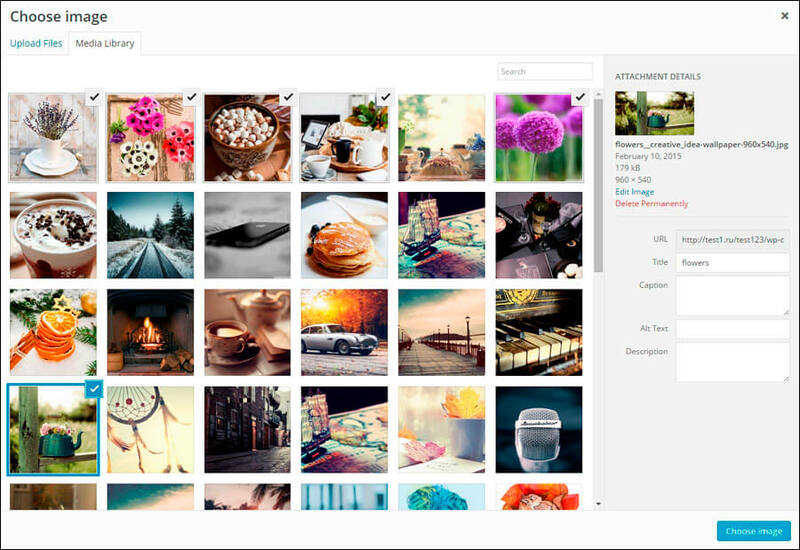 Categories tab – add tags for image categories. Linked images tab – add linked images to the chosen image. More detailed information about Images Settings you can find here. To get back to the settings of gallery – сlick “Properties” button. Important! After changing the settings of gallery don’t forget to click “Save” button. After you change some settings – with responsive photo gallery plugin, you can immediately see the result in a live preview in the left bottom corner. In order to see how the other options of responsive image gallery look – you should click on “Preview” button and will be able to see the whole gallery in a new tab of your browser. Under the window with image preview you can see the shortcode of gallery. Copy and paste the shortcode into your post or page and Gallery by Supsystic plugin will automatically create the gallery on your page using the settings you choose above.